1ST DECEMBER TO 31ST JANUARY 7 NIGHT MINIMUM BOOKING. floating market, The expansive open plan living room features beautiful wood floors throughout creating a homely and comfortable ambience. The property has two kitchens -indoor european kitchen, and outdoor Thai style, plus BBQ. Pool Table. The outdoor tropical garden is exquisite and the perfect backdrop to take in while enjoying a swim in the private 65sqm swimming pool. The expansive tropical garden features an adjoining Thai 1 bedroom Pool house, and outdoor terrace area perfect for lounging and enjoying an afternoon at the pool side. If you prefer the sea and sand, Jomtien beach, known for its laidback vibe, is only 2 km away. A second covered terrace is provided on the second floor and is an excellent setting to enjoy a romantic meal alfresco or a few coctails with friends. The second terrace is further graced with an excellent view overlooking the lakes adjoining Pattaya floating Market. All the angles are covered at Beverly Thai House Pool Villa with plenty of unbeatable spots to relax in the shade or sun. Residents are asked to refrain from smoking inside the villa in order to maintain the fresh and pleasant atmosphere, but smoking outdoors is allowed. 24 hours security and security alarms throughout the property are provided ensuring you pease of mind as you unwind and enjoy your Thailand Holiday. Location: a short 2km from Jomtien Beach, countless dining and entertainment options are easily accessible from Beverly Thai House Pool villa. The main strip in Jomtien is home to numerous Thai and International restaurants serving up mouthwatering meals day and night. Other attractions a few meters from your doorstep include the Floating market and plenty of white sand beach areas for sunbathing and swimming. In just a 10 minute drive you can access the famous Underwater World, Silverlake Vineyard, Alangkam Theater, Vihamra Sien Chinese Temple, and the popular phoenix Golf Course. Tesco lotus and Big C shopping malls can offer you any amenities you might require and can be reached in 5 minutes or less. 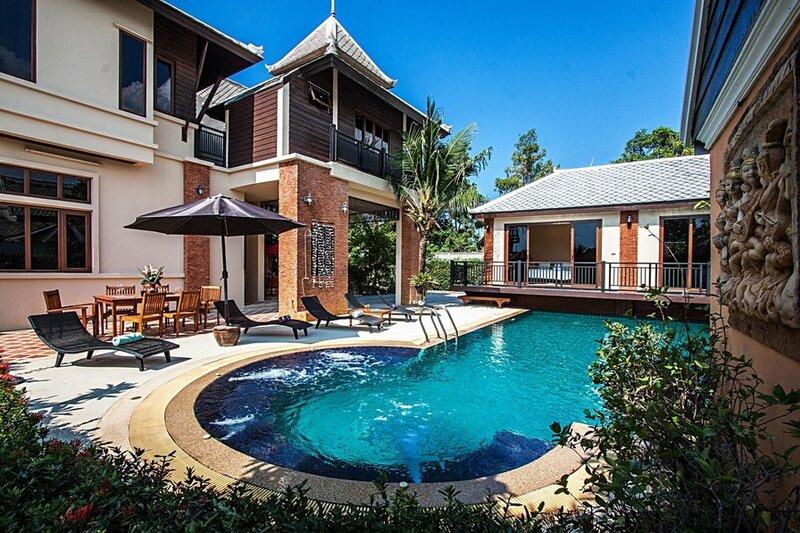 The heart of Pattaya can be reached in a short 10 minute drive, or 15 minutes by local transport - making Beverly Thai House Pool Villa the perfect location for enjoying a tranquil and peaceful holiday not far from the many exciting and memorable options that Pattaya has to offer. Nearby Attractions Include: Numerous Golf Courses, Flight of the Gibbon, Big Buddha Hill, Pattaya water park, Sanctuary of Truth, windsurfing, catamaran boat trips, Nong Nooch tropical Gardens, Tiffany's cabaret, pattaya elephant village, Mini Siam Pattaya, Many fine restuarants. Sailing & Golf within 15 minutes drive.